RJ Botha, understudy to winemaker Alistair Rimmer at Kleine Zalze in Stellenbosch, says that they are on a mission to “tighten up” the all the wines in the portfolio. 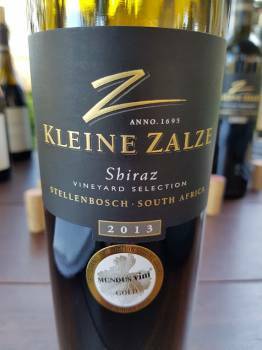 The Vineyard Selection Cabernet Sauvignon 2013 rated 90 in the recent Prescient Cabernet Sauvignon Report and the Shiraz 2013 is also excellent. Matured for 18 months in French oak, 30% new, the wine shows red fruit, white pepper and fynbos. The palate is medium bodied with lovely pure fruit, fresh acidity and fine tannins. Very much on trend. Price: R115 a bottle.